It's hard to believe so much can happen in just 4 days. Today is Friday, which is awesome, but all the days kind of operate on equal footing in my life. Friday just means that I have 2 days that my husband will be home to equally endure my pain! So the week started off with a bang. I launched my quilting business at prices I could have only imagined paying before I spent my kids' inheritance to buy a longarm. In under 24 hours I had about a dozen people commit me about 20 quilts to quilt in the next 2 months. I was flabergasted so many people were out there. There were more I had to turn away on account of needing to also do my own Christmas gifts in that period. Now I think that is in jeopardy. Hello Target & the mall! Monday I gave an exam to my sometimes remedial Thermo students too. I actually have a dozen or so that are spectacular students, another 4-5 that will pass and another dozen that could pass as vegetables. They are not the ones you want designing the next space station, trust me. The exam blew even the good students away. It makes me hate facing them when morale is failing. Today they get back the scores and they are awful. With another exam looming on the horizon, I need a definite pick me up for the class. Heck, I need that. On Tuesday I learned that my inlaws have the Swine. Joyous. Just joyous. They estimated getting it the previous Tuesday, TWO days after we visited them for a day. That's all I need is to have a houseful of swine flu sick kids. I cannot even get my freakin pediatrician to give my daughter a regular flu shot! Wednesday came and brought me a cold. Or what I hoped was only a cold. My head hurt, I was tired, I felt yucky. My mojo was draining. Many of you know I have cats. I have (or now "had") one that is beautiful long haired orange. Henry's the sweetest disposition animal and totally reminds me of 2 other cats I have had that look just like him. I think that is why I got him at the shelter 1-1/2 yrs ago. He turned out to be diabetic requiring 2x shots. He needs special food at the tune of $30 per month. And over the last few months he's had more "accidents" on the floor than I can count. I really don't think that they are accidents. I think he's wicked lazy. He's completely ruined the hardwood floor in our kitchen. Well, yesterday I did the unthinkable and I took him back to the shelter, crying the entire way. We have no idea how old he is or how long we'll have him pooping on the floor. I just hit my breaking point. And to make matters worse, one of my other cats is missing. She ran away Wednesday. She never ventures far, but to date has spent 2 nights outside in sub freezing temps. It's not looking good. I'm sad and stressed. So there it is, not pretty, not fun, and the reason my creative mojo is zapped. Before when I got stressed, I could piece quilts with the best of them to work through the stress. Quilting them is different. It takes a strong inner calm place to be creative. Maybe I should take up yoga! Guess I'll go conquer a binding. Here's a few peeks at quilts I finished up this week... here, here and here. (Sorry, I'm making the reader double click for anything to see today!) I'm not sure there's another 9-patch quilt in my future, but the others were fun to make. Have Met Quilting Quota for Holiday Priced Long-Arm Quilting! I know there are likely to be more of you interested in my business-launching initially-very-low priced longarm quilting, but I have nearly 20 quilts on the docket right now. I am awaiting hearing back from Beth. Otherwise, if I have emailed you back, I will do your's. All of the rest of you will just have to stay tuned. If people happen not to send their quilt tops as they have committed to, then I may open up this offer again. I will be taking customer quilts in January, and although the prices will not be this low, they will still be good compared to the going rates. I like the idea that the "average" quilter can still afford nice quilting. Thank to all of you that are making the opening of my business a success! 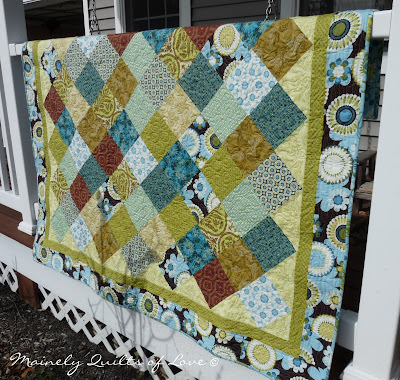 An Early Christmas Quilting Extravaganza! Greetings Quilters!! This post is designed mostly for those quilters that love to make quilt tops, but don't love or have the ability to quilt them. As a special for the months of November and December, I invite you to send me your quilt tops, and let me quilt them for you. This is a great way for you to complete some projects, and possibly have some fantastic Christmas presents too. 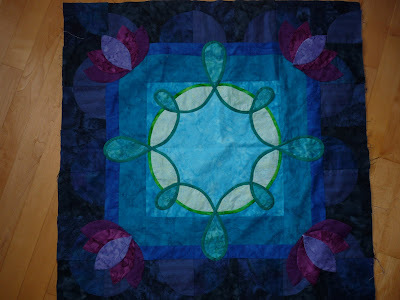 Plus, I am offering a wonderfully low price per quilt since I am eager to "kick start" my longarm quilting business. It may have some detail quilting, but I am not promising more than a pantograph-style quilting. 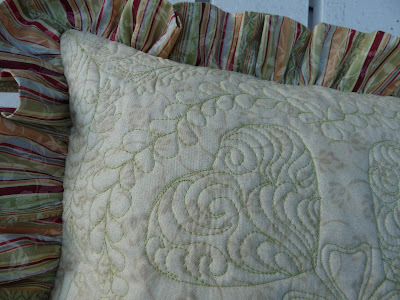 Some of the styles that I quilt proficiently include a peacock loop pattern, general meandering, loops & hearts, vining leaves with flowers & curling tendrils, swirling pattern, ripply water, and more, etc. My repetoire of quilting expands daily, so if you have an idea, just ask. I can supply batting if desired. I use Hobbs Heirloom 80cotton/20poly. My prices are: $5 for baby quilt (to 40"x40"), $7 for a lap quilt (to 60"x60"), $11 for a twin quilt (to 65"x85"), $14 for a queen quilt (to 90"x95"), and $20 for a king (to 108"x108"). I am finishing quilts daily, but my website http://www.mainelyquiltsoflove.com/ has detailed pictures of some of my quilts completed to date. By week's end, I should have three more shown there. My quilting is neat and expressive. I assure your finished quilt will reflect my personal sense of carefulness. You will not be disappointed. 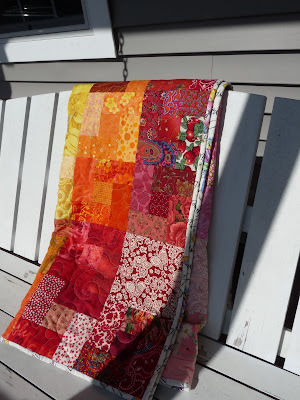 I can quilt 4-5 per week. I will take these on a first come-first served basis. If you are interested, please email me as soon as possible to reserve your spot, and I will send you the mailing information you will need. My email is msolomo1@maine.rr.com Also let me know if this must be sent back to you by December 1 because it is a present for someone. These prices include the quilting only. Batting is additional unless you provide it. I ask $4 per quilt for thread & needle (I change for every quilt), which is very reasonable. 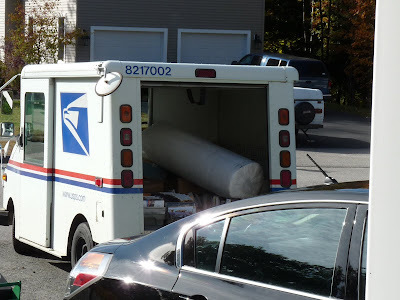 Similarly, the quilt will be returned to you at your shipping cost. I will use the USPS. I will take a personal check, cashier's check or Paypal. Please note that I will charge an additional 3.5% if you choose Paypal to cover their fees. 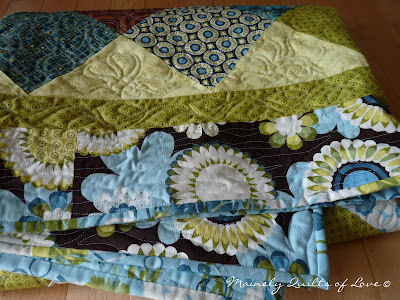 If you send more than one quilt, I will take 10% off of the lower cost quilt. I'm asking that anybody that reads this kindly post something about it on their blog. Word of mouth is so paramount to getting a business off the ground. Regarding the backing & batting (if you decide to send it)...They must be 5-6" larger than the top (which also shall be square). 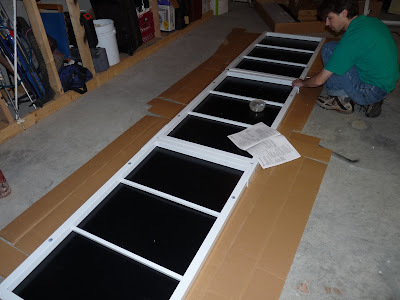 In other words, if your top is 60"x60", the backing and batting must be about 66"x66". I will return this excess to you if you want. I often use this for bindings on my quilts. Have a great week, happy quilting & I hope to hear from some of you soon! Please feel free to copy the button on my sidebar and add it to your blogs. Please link to this post directly. Yes, that is me. A total NitWit, capital "N", capital "W". I was fortunate enough to find a person willing to send me a small piece of the fabric which my cat damaged (see last post). It arrived today. Upon further inspection, I realized that 2 of the fabrics in the 9-patch block had claw tears! I could have screamed!! But fortunately, Ms.Jan is to the rescue, and is popping the other 5" square into the mail for me today. Phew...and a huge thanks! So, this week has been busy and fun. 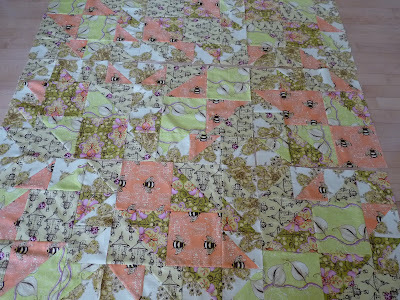 There has been plenty of learning to longarm quilt going on. I have temporarily mastered that initially difficult cotton thread tension. I feel wiser because of it. It could be a false euphoria that is going to come back and bite me in the arse in a week, but one happy day is good for something. I have quilted a total of 3 quilts since getting my machine up and running 9 days ago, including the quilt my dumb cat has tried to maul. It is a learning experience (I did opt to rip out a border I quilted to try something I thought might look better - a painful 5 hour seam ripping experience). Here's the finished ColorBlock quilt with binding and sunshine for an outside photo shoot. I don't know what I'm going to do when this photo spot is half covered with snow!!?! Here are some pics from what I call "Sea & Sand". 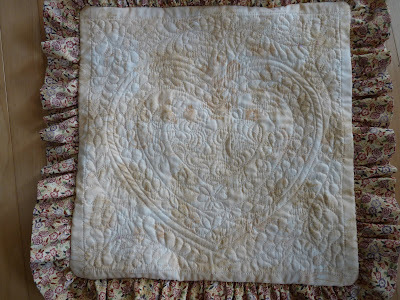 I showed this flimsy some weeks ago, but just got it quilted this week. It is absolutely the most SOFT quilt. The quilt is 54"x60", and took me nearly 4 hours to quilt. 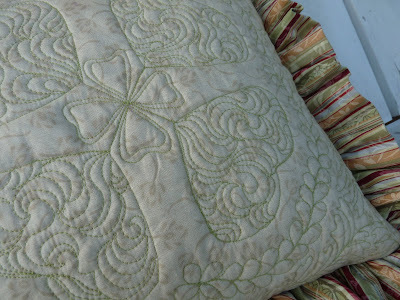 It is rather densely quilted with a So Fine thread. These Marcus Alfresco prints are totally yummy - it just reminds me of driftwood and sand at the beach. Here's a little sun design I did on the setting triangles. It may be a little Aztek-ky, but I saw it done somewhere and wanted to try it. The thread is a soft aqua, so the meandering leaves on the 2" inner border don't really show up much. Hindsight! You can double click if you want... - it's really pretty! Hope you have a great weekend. We are getting a massive anount of rain tomorrow, so I gotta take my little girl outside now for a bit. Cheers! Before I announce the winner, I want to solicit the readers and ask a favor. I am in need of a 3"x3" piece of Sandy Gervais's Crazy Eight Circles & Dots in Berry (aka red). If anybody has this and could spare the 3" piece, I'd be ever so grateful!! Please email me if so...I have a square I have to remove from a quilt because my very stupid cat ripped it with her claw! And the winner of a quilting of any quilt up to a lap quilt size (approx 60"x60") is...#7 (Shawn). If you happen to see this, please email me at msolomo1@maine.rr.com. I will also try to contact you. 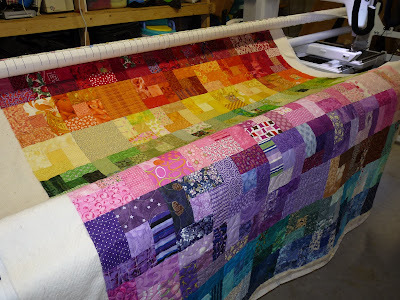 As I said before, I will quilt any top within that size for you, but not until January 1, 2010. So sorry about that, but I have many tops right now in need of doing as well as the need to get onto some Christmas presents! For those of you that did not win, I will be hosting a quilting extravaganza probably starting next month where I will hold a grand opening of my long arm quilting business. I will be taking quilts of all sizes for quilting at a steal of a deal (for a limitted time only). So, stay tuned for more information! 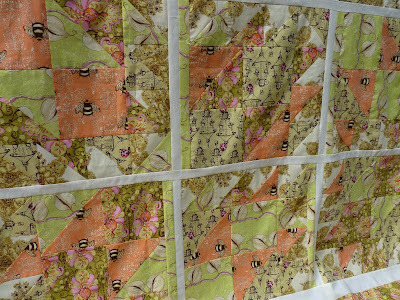 And you can see my quilts as they are being quilted on either my new website or at my etsy shoppe. ...and my mail lady dragging them one by one on her back to our door! Nice to finally have a lifetime supply (I know, yea right!) in my possession! 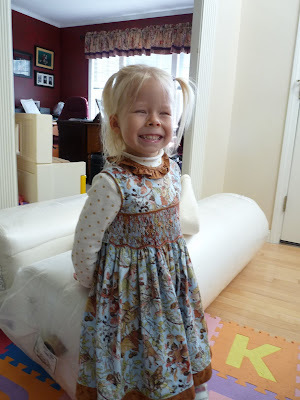 And happy daughter modelling her birthday dress with all the batting rolls. Always the camera ham. 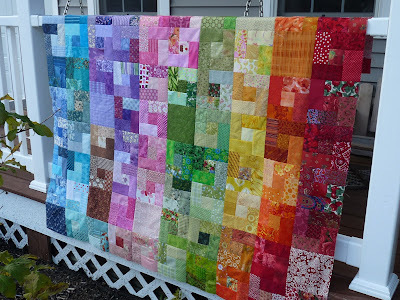 To get on with the process of learning to long arm quilt, I loaded my Rainbow Colorblocks quilt onto the frame. 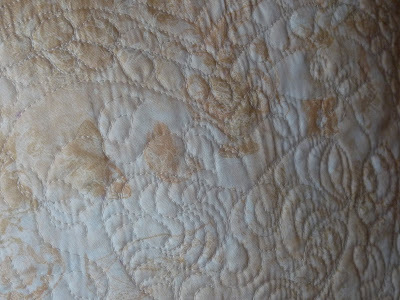 This is free quilted in swirls in a tan So Fine thread - the only color I have until an order of a few cones arrives, hopefully next week. I am very pleased with how the quilt turned out for it being just an allover pattern. The tan thread just mostly disappears in all the colored squares, and blends with the backing. Here it is on the frame. Notice that the dungeon is not so dark anymore. $200 later, I have a dedicated outlet, and some nice bright lights that run the length of the machine. It's much nicer now! Here's a quick peek at the backing. It's very bold and fun - definitely a quilt geared for a young to teenage girl, but then all those bright colors were not really intended for the guys anyhow. I happened to have just 3 yards of this fabric and it coordinated so I used it. I have no idea what will become of this 1st quilt of mine so I was not going to put additional $$ into finding that perfect backing. I think that this is it! Where to from here?? Not really sure. I have many more tops to conquer but they rely on a perticular color thread. I suspect I will play with cotton thread tensions again in hopes of mastering it so I can move onto one of these other quilts. Houston, we have liftoff. Finally. My LA is functional. I have a minor thing of finding out why I cannot determine where the laser pointer goes, but that is simple compared to not having a rail to place the carriage onto. Last night I figured out to thread the thing and how to make a bobbin. I loaded on some cheap muslin and tested a few stitches before I crashed in bed. I have done a little bit more today, but still have plenty of practicing to go. In case you are thinking I have a sewing cave...You are right. It's a modified basement space. Not gorgeous, but 800 square feet all for me, and my 4 machines, iron, fabric stash. 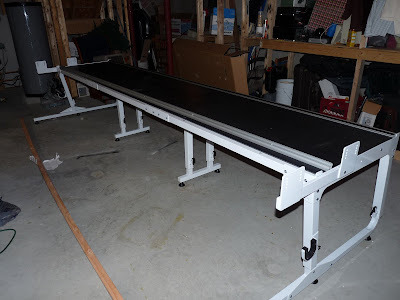 I have an electrician coming later this week to install overhead lights across the length of the longarm. I can't wait! A peek at some of last night's doodling...Don't scrutinize too harshly. I know I have a ways to go before I am competent enough to quilt for hire. I ordered a few "tools" today (1/4" guides in various shapes) and 4 pantographs to practise on. My damn batting has not arrived yet and the stinking company has not returned my call either. That's my largest holdup in practising more - I hate to go buy more when I have 60 yards of 96" wide coming, allegedly. Must be coming via camel. I really want to make decent feathers so I think I have to invest in a book or two to show me some technique. Suggestions?? And real work from the weekend... 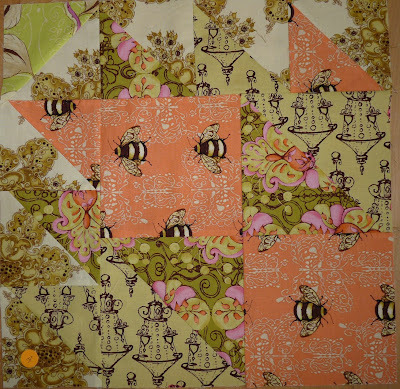 I have made 5 more blocks for my row robin quilt. These are red & green stars. Hopefully I will get usable blocks from all partners, but I guess it's nice to have a few more. At least I know I like them! ...and a close up look. I'll show more soon when I feel it is interesting! table coming out of the boxes...all 400 pounds of it. It's starting to look like a frame... especially after adding the rollers. First off, thanks for stopping by my humble blog. 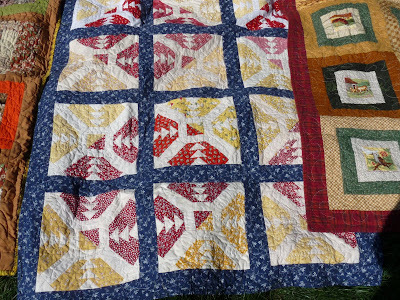 There are tons of fantastic quilts being showcased on the Blogger's Quilt Festival, hosted so wonderfully by Amy at http://www.parkcitygirl.blogspot.com/. This is a fun event and I am excited to be a part of it yet again. I have a great post to share with you, and at the end of some fun pictures, there is a giveaway, so don't miss it. So without further adu, let the show begin! 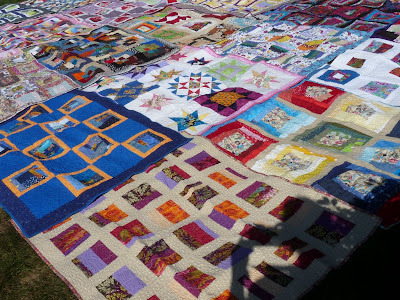 Over the last year or so, I have made a lot of quilts. 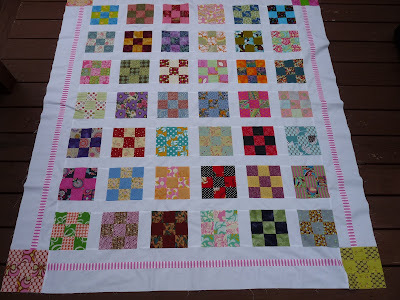 I have been active in many swaps, both those that make mini quilts and those that make just blocks. I usually make quilts for baby gifts or Christmas presents. Most of the quilts I have made are linked on the sidebar to the right. 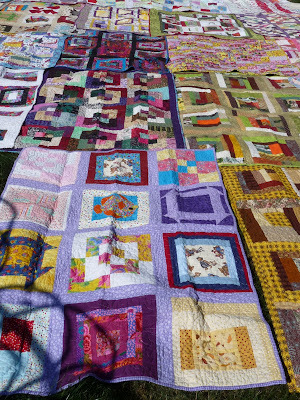 The quilts, however, that I am most proud of are the ones I am showing you here today. Over the course of the last 3 years, I have made over 100 lap-sized ~45"x65" quilts to donate to the local chapter of Project Linus. In January of 2007, this started as an effort to trim my scrap stash, which at that time was really not very large. It gave me something to sew without needing to buy fabric too! That quickly became addictive. I told my friends and family what I was doing, and within a few weeks I had a dining room full of more donated scraps! And that is how the cycle began. Last Fall, at a Linus function entitled the Book-Blanket Challenge I showed this quilt (which incidentally was my entry for the Blogger's Festival in April too!). Our local chapter was closing because the rep was stepping down and a replacement had not been found. She had been trying hard to get me to take over the position, but my life was too busy for that then. She had two large boxes of fabric which had to contain 60+ yards of top quality material which she gave me. I told her I would use that to make quilts to give back to Project Linus. And I did. 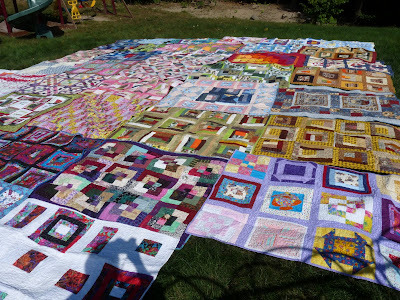 Last month, I broght 53 quilts to donate. These were made between January and September of 2009. 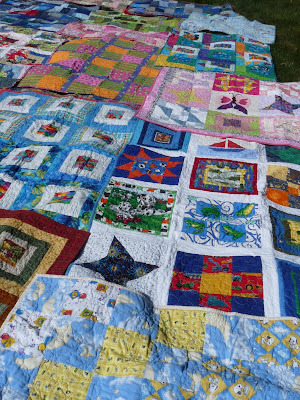 The day before I brought them, I layed them all out on my yard for a little "quilt show". One blogger commented that it looked like a "Sea of Love". I think she was right. 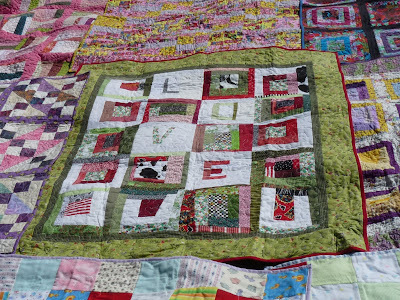 Many are scrap quilts. 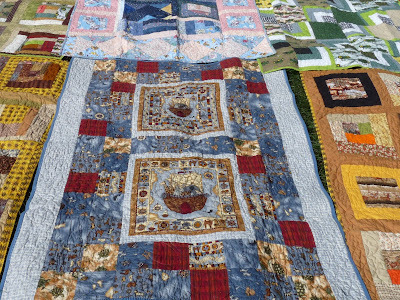 Many are quilts I designed. Some were done to let me "test" a pattern or an idea. Some let me practice certain machine quilting techniques. Some were made from blocks acquired in various swaps. All will be loved and cherished by the children that receive them. They say it takes a village to raise a child. 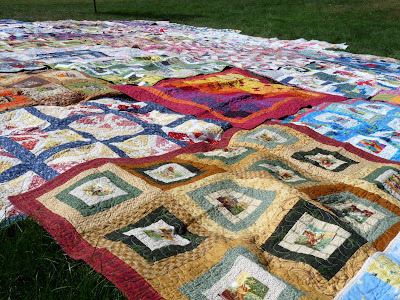 If what was done here for the children is of any similarity to that, I'd be remiss for not mentioning a few of the wonderful people that helped make this 53 quilt donation become possible. The quilt above had the indiginous Australian fabrics donated to me by Bernadette in a swap. The one below was made from swap blocks from the Broken Heart pattern by ladies of Kate's Birthday Block swap. I hosted the Spring Fling Round Robin earlier this year and received blocks to make 5 quilts from these talented ladies. 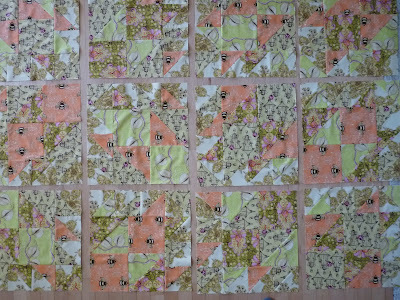 The aforementioned Kate sent me 24 Jacob's Ladder blocks and another 24 Bento blocks to make another 4 quilts. Such overwhelming generousity. And I have never even met any of these people either. It's true, I did spend a ton of time assembling, sewing, quilting and binding these. It's a labor of love, and if this is the only time in my life that I am able to make such a grand donation, I am still satisfied. 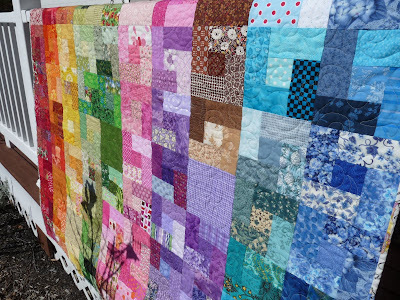 And yet another quilt below made from more donated fabrics from Anna Y. The quilts here represent on the order of 275 yards of fabric & batting! I spent much of my quilting time this last year on the quilts I showed you here, but the time has come for change -- a change in my quilting focus and a change in my personal/professional life. I am a trained and experienced mechanical engineer. 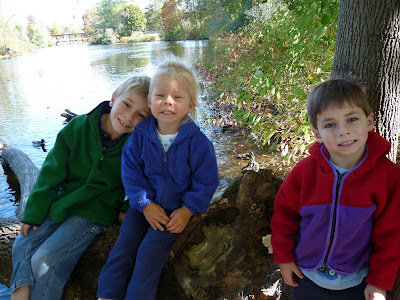 Since having three kids, however, I have realized that going back to work full time is unpractical and just daunting. I want to be here at 3:30pm when they arrive home. So after much soul-searching and planning, I have opted to take a plunge off the deep end so to speak. For those of you that read this blog, you know this. 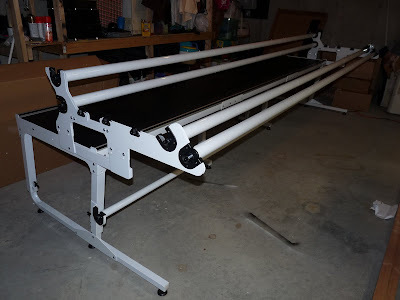 But for the sake of the newcomers, I will mention that I just purchased a long arm quilting machine. And I am in the process of trying to establish a business making and machine quilting quilts (that is after my husband helps put the frame together this weekend!). 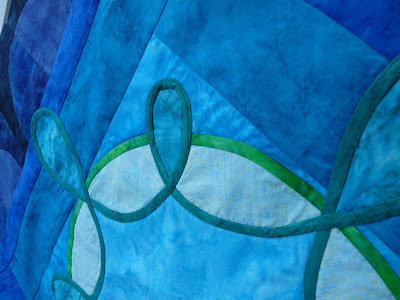 I encourage you to bookmark my new business website http://www.mainelyquiltsoflove.com/. Visit often! At present, all I have shown there are a few small items and a number of quilt tops that I will quilt in the coming weeks. I will, however, be adding to this soon. Once I am taking orders, I will very likely do an internet quilting special for a while, with an extraordinary price! 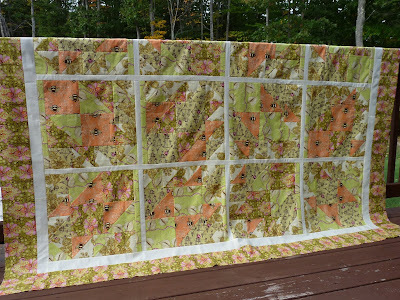 As a giveaway in support of the Online Blogger's Festival, I will offer to machine quilt one person's quilt. It may be up to a large lap-size. You'll have to provide the batting and the postage, but I will quilt an all-over pattern which compliments the top. I will offer to do this anytime after January 1, 2010. I will randomly select someone at the end of the Blogger's festival. 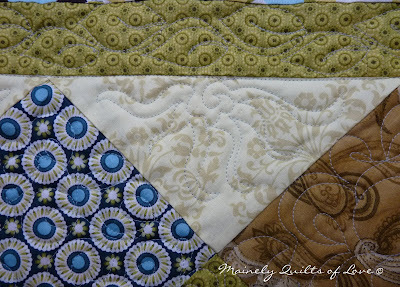 To be included, please do the following...(1) leave a comment here, and (2) blog something to your personal blog that promotes my blog and new Mainely Quilts of Love Quilting business. Thanks and have a great time spying all of the fantastic quilts. One last thing...I am hosting a block swap on flickr. 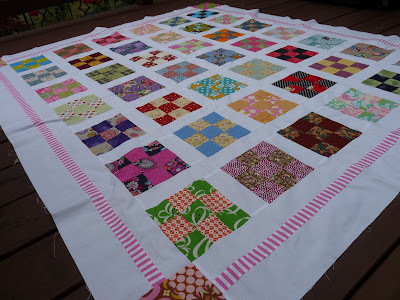 If you are interested in a swap that will yield enough high quality blocks to make a queen sized quilt, with a monthly committment of only 2 blocks, check it out! I couldn't have been more right yesterday when I thought that these blocks might be better off sashed, despite not planning to do so initially. Fortunately I had a couple yards of ivory Kona on hand which matched nicely. There is a certain randomness amongst the blocks, which I was going for. 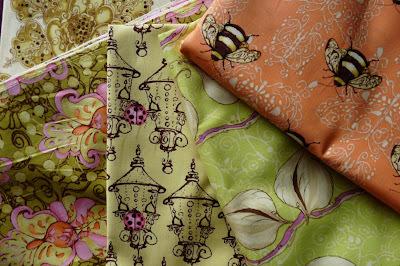 Yet, the sashing makes the random nature of the fabrics and design have a sense of order too. I will machine quilt this soon (I hope) and bind it in dark brown. It fits a twin bed, and with any luck will be snatched up from my Etsy shop once it is listed. With not finishing quilts lately, I have had a void of hand work to do in my evenings while I watch the TV. So a few weeks ago, I dug these out (which I got for my birthday a few months ago, and really had just not had a grand epiphany as to what to use them for), and began designing a mostly hand sewn piece. It has lots of bias strips on the plan, as well as more appliqued flowers. I have many feet of 1/4" bias strips in a few shades of green ready for an intricate swirling pattern around the border. And after the lotus flowers were hand appliqued. Yes, it is all needle turn, which is a totay joy to do with the hand-dyes. They are so tightly woven that nothing really ravels or streaches out of place. The green border will connect into the bottoms of the flowers. That is why they are not sewn completely down yet. I have a plan for something in the center, and perhaps another border as well. ...and a close up of the corner. I love the drunkards path border in very subtly changing shades of indigo. Stay tuned, there will probably be another update to this in the coming weeks. And the moment we have all been awaiting (or at least I have been waiting for)...the LA is officially here. I am something excited!! 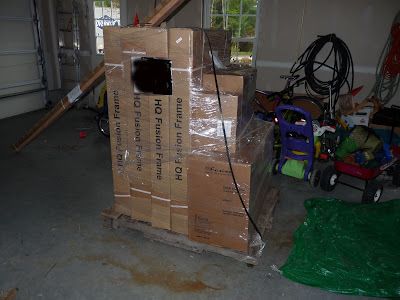 There are a few additional items that my rep may have neglected to order which I must followup on, but the big boxes are here. I've never had a UPS delivery need to come to be via 18-wheeler semi tractor trailor truck! Probably go buy some batting. I have ordered 60 yards wholesale 12 days ago, and it has not yet arrived. Must be coming by camel! Looks like I may need some before this weekend is over. And for any of you that have read this blog, you know that this is the day that my Fusion will be delivered. I'm more excited than a kid in a candy store with money to spend. It's wreaked havoc on my productivity today. I've had trouble focusing on what I had planned to do ever since the call from UPS came in. Thank goodness for a long weekend because my husband has his work cut out for him! Rarely is there a fabric line or designer that makes me go completely berserk. But I am so completely head over heels for most of Tina Givens's stuff. I like Annabella, which I got a large quantity of free last month at a Project Linus event. And I really like Cloe's Imagination, which sadly they did not have that day. But...because I have absolutely no will power whatsoever sometimes, and because I found this at Whittles for $3.50/yd, I got a bunch of it in this colorway, and in the blue-purple. I have a twin and a queen quilt on the design board. 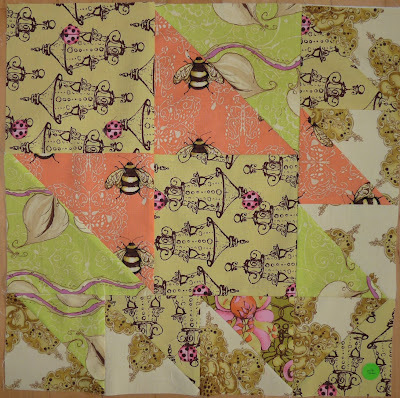 I especially love the deeper green whimsical print, and the bees are so totally fun too. 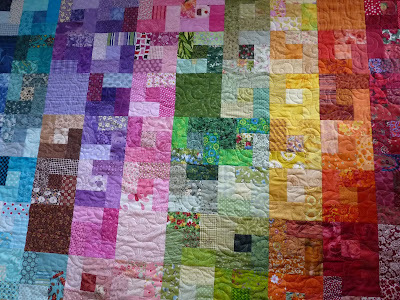 Now I had originally designed a "large block" style quilt. 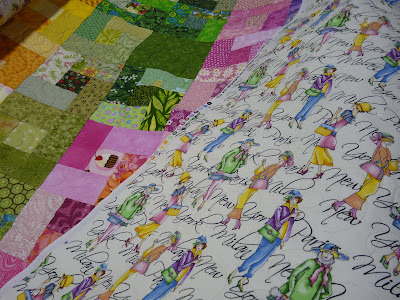 The larger scale prints often get lost if you overdesign quilts and have smaller cuts. Plus, this makes it sew together quicker. Today I finished with 12-16" blocks. I'd planned for the top to be just pieced blocks without sashings, but any design in these blocks is completely lost without using a sashing. So...on to plan B. Pardon the crappy, low light pictures. It's been pouring here all day, and that's just life. I spaced out the blocks to simulate sashings. I have both ivory or brown available. I'm leaning towards the ivory, but a narrow 1" sash between the blocks and maybe 2" around all blocks before the wide outer border of the deeper green print. After realizing how totally crappy the previous pics were, I added a couple of two of the blocks, just to show how whimsically fun the fabrics are together. Really, they are square - they may just look wonky because of my photography skills. I finally pieced all (or mostly all) of my Colorblocks together. This is 90 blocks, with about 8 unpieced blocks worked in to make the top a little larger. I still have a few of these blocks put aside to do a few other things which are smaller. I have no idea what to use on the back, but I know it is not in my stash of fabrics! Perhaps a boldly colored stripe?... It'll finish lap sized at 55"x60". 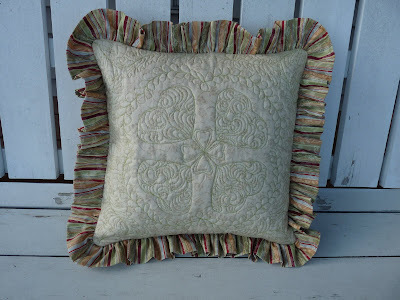 ...And another pillow cover. 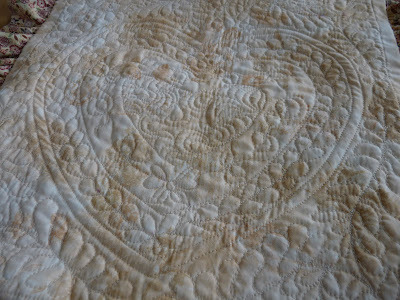 It's once again 14", and has a fun free-handed all-over pattern that I machine quilted. 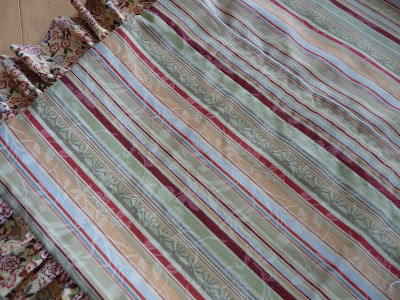 This pillow has the striped fabric (which was on the backing of the last one) as the ruffle. 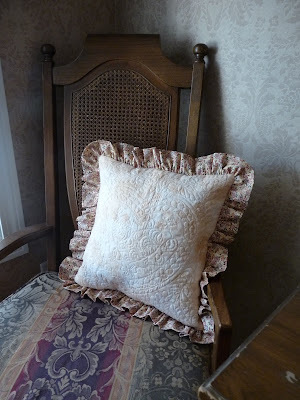 I totally detest gathering ruffles, but I really like how they complete the pillow. The front fabric is a subtle tan print. Finding "subtle" or simple prints in my stash is a trick. I guess I generally find them boring and don't tend to buy them. This was a free FQ that Whittles sent me with one of my recent massive orders. 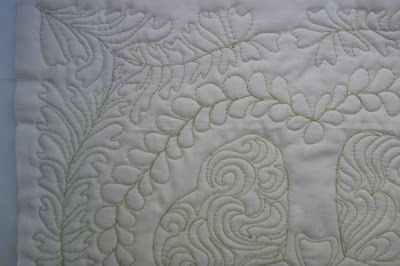 The quilting is in a sage green thread. It did exactly what I hoped for - made the pillow front appear more green than tan. I once again tried my hand at McMargaretting inside of the hearts. On day it will look better, but not so bad today. 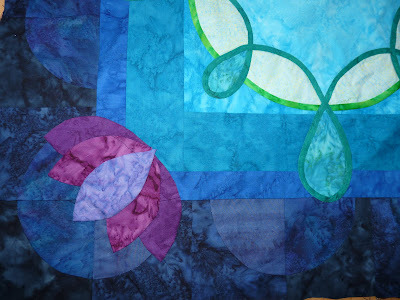 The meandering feather is free quilted. I think I may have marked the spine (hence, any lingering purple marks are my pen which will fade soon). And one last peek at the leafy feathering variation I tried in the corners. I wanted to try something a bit different from the traditional feathers. This picture was taken of the inside of the pillow (just muslin) before pillow construction. Last weekend, I satisfied my itch to try a whole cloth machine quilted piece. It is a 14" pillow/quillow. The lighting in my house has made taking a good picture really hard. It is a softly patterned peachy fabric. I wanted to try my hand at feathers, both the wreath variety and the ones done in corners. All I marked were the hearts and the spines for the corner feathers. You can probably see more by double clicking. I think it turned out pretty well, although my "Mc Margareting" needs practice still. In preparation for having my LA, I have been on a frenzy of making tops. Here's yet another one, made from the 9-patches of the 3x3 swap I did this summer. It may be a charity quilt, or I may try to sell it depending on how the quilting comes out. It's pretty fun so far I think, despite my indifference about some of the blocks I received. That really needs qualifying - individually, I don't love all of my blocks, but together, they seem to have a different liveliness.